Cultured. Captivating. Dynamic. Thailand combines world-class beaches, breathtaking temples and idyllic islands making it a stellar destination. 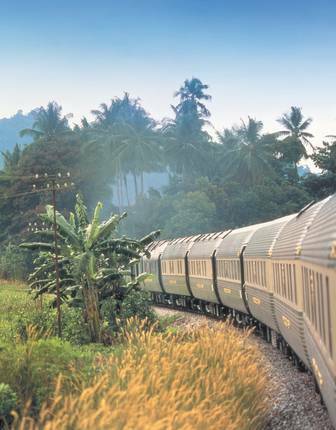 Long a favourite among romantics and adventurers alike, holidays to Thailand excite with wildlife-dotted rainforests, impress with Buddhist wonders and soothe with island paradises. 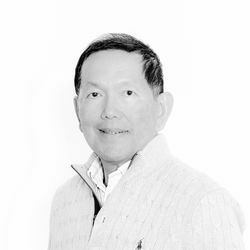 Unlike each and every one of its neighbours, Thailand dodged the weighty influence of Europe’s colonial powers. The result? A uniquely preserved cultural heritage that plays out across everything from gilded palaces and dramatically tiered temples to that impossibly moreish cuisine and a truly spectacular natural world. 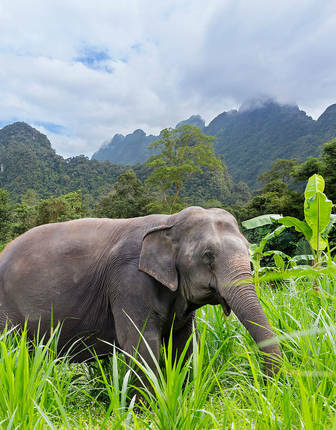 Elephants roam old-growth rainforests, ancient villages crouch in the north’s jungled hills and crystal-clear waters are backed by pristine white sand. 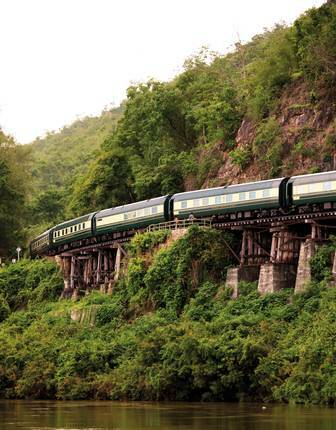 Indeed, there’s perhaps nothing more indulgent than hopping between the country's islands, discovering secret palm-fringed beaches among green-dappled karst towers. That’s not to say, however, that you’ll be without more than a touch of luxury amongst all that unspoilt wilderness. 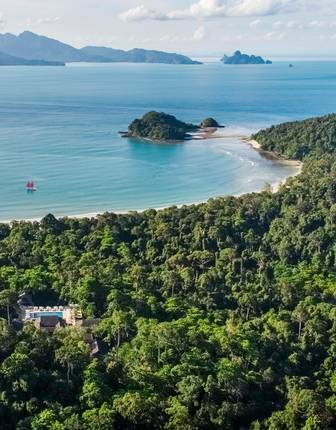 Thailand is host to some of the world’s finest accommodation, with the likes of private beachfront villas and even floating rainforest camps competing for your attention. And, never outdone, in Bangkok you can stay in pool-capped skyscrapers, their futuristic neon set between the city’s silted markets and century-old teakwood houses. The Thai capital is a true feast for the senses, from its vibrant streetfood scene to its incense-fragranced monasteries and the burnished gold of its Royal Palace. Take an immersive tour of Bangkok from its secret klongs to hidden street food markets, enjoying exclusive access to the Grand Palace where a historian will bring the past to life. Uncover out-of-the-way corners by long-tail boat in the company of a knowledgeable local. 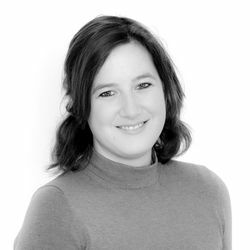 Meet the city’s finest jewellers and antique dealers and try to secure a treasure to take home. Go on a food safari with a chef and then have a cookery class in their kitchen to discover the spices and flavours of local specialities. 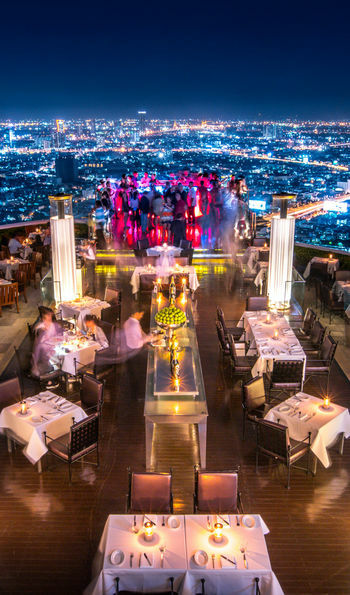 Let us secure a chef’s table for two at the legendary Blue Elephant, one of Bangkok’s signature restaurants or settle onto a luxury barge on the Chao Praya River for a sunset feast. Work off all that fine dining and get fighting fit in a muay Thai gym. Let a monk bless your onward journey in a private ceremony. 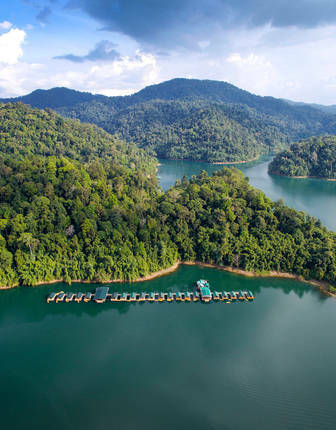 Head into jungle-clad hills on foot to encounter remote tribes and trek through dense rain forests on jungle trails. Experience the charms of Old Siam on Koh Lanta. 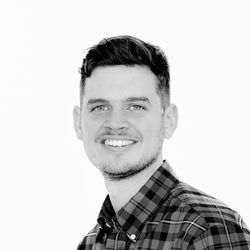 Try a dose of futuristic treetop living at a chic jungle bolthole, dining in an intimate treetop pod or at a lantern-lit beach table set up just for you. Let a professional masseuse soothe any aches with a couples spa treatment tailored to your needs. Enjoy a jaw-dropping helicopter or speedboat ride through the amazing limestone karst formations of the Phang Nga Islands before settling back to enjoy a celebration dinner event complete with musicians, performers and fire dancers. 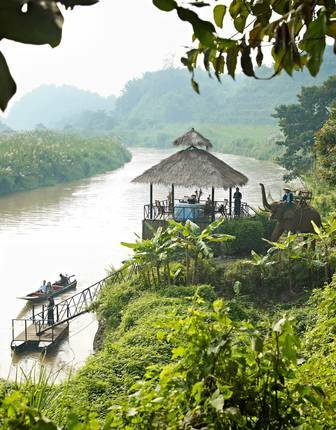 Climb aboard a specialist vessel for a cruise up the Mekong River and into the heart of adventure. 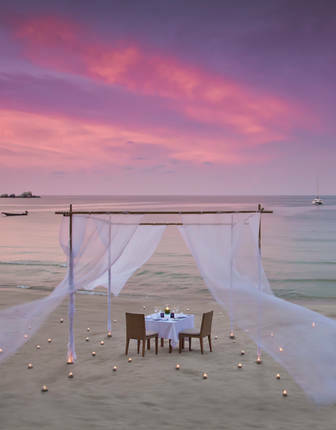 In a country awash with luxurious properties, combine slick contemporary city stays in Bangkok with boutique beach escapes that are ideal for barefoot luxury such as Anantara Rasananda on Koh Phangan, the Sarojin on Khao Lak and Six Senses properties on Samui and Yao Naoi. 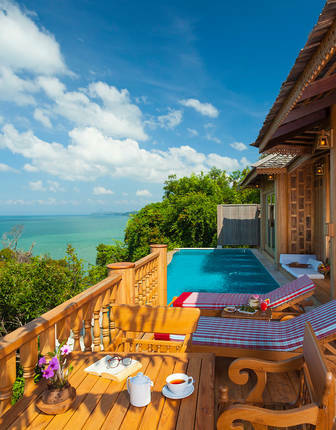 Alternatively try the luxury villas of Pimalai on Koh Lanta. 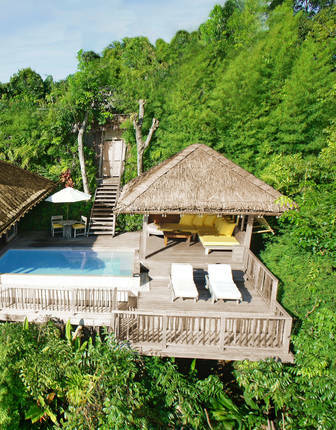 Look out too for luxurious spa retreats, converted palaces, luxury tented camps and even a place where you can catch a glimpse of three different countries from a single hotel at the Anantara Golden Triangle Elephant Camp. 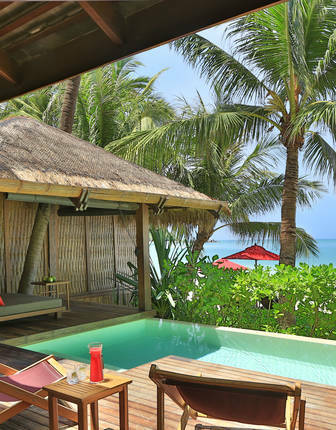 Between its luxury villas, gourmet dining and beachfront setting, Pimalai is an ideal island getaway. And, you’ll return from a full complement of complimentary water sports to award-winning infinity pools and spa treatments. 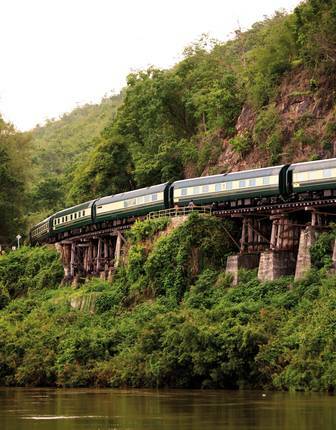 Southeast Asia’s only luxury train pairs vintage opulence, fine drinks and finer dining with views of lush jungle and ancient temples. 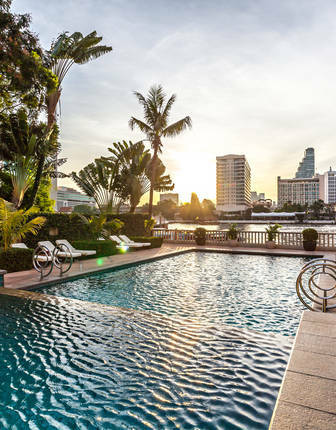 Timeless, glamourous and effortlessly elegant, this landmark Bangkok hotel takes pride of place on the banks of the Chao Phraya River – the Thai capital’s River of Kings. 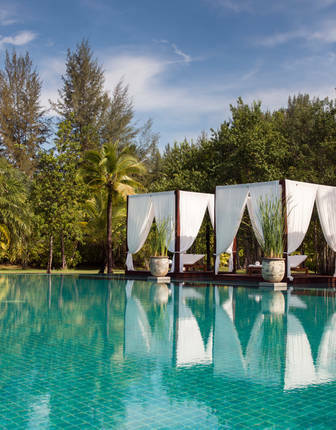 Tropical Thai gardens and a secluded seven-mile stretch of glittering beach surround the Sarojin Khao Lak. 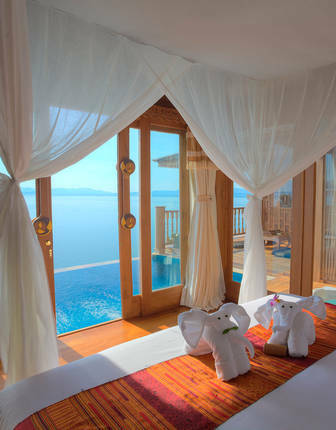 It’s a boutique hotel and perhaps the most romantic in this beguiling corner of Thailand. 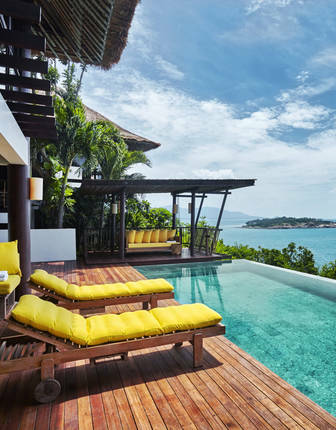 Understated, barefoot luxury with spectacular views of islands and sea, hidden among 20 acres of gardens and set above the Gulf of Thailand’s shimmering blue. 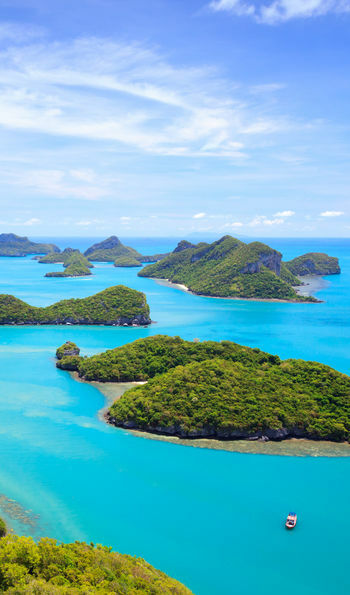 Phang Nga’s bay is one of Thailand’s most iconic, studded with fabulous limestone pinnacles. 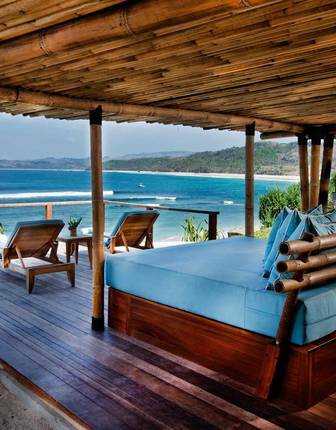 This Six Senses resort sits among it all, showcasing private pool villas and standout service. The name says it all. 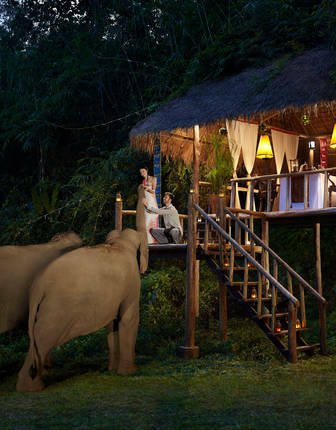 The Anantara Golden Triangle Elephant Camp and Resort has views of three countries from one sublime spot. 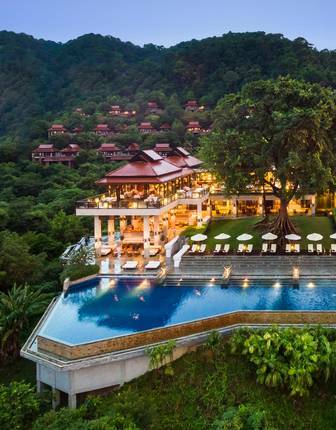 Thailand’s northern jungles, neighbouring Myanmar and Laos, surround this elegant resort, and an elephant sanctuary is right on the exotic doorstep. Sophisticated safari style tents provide sanctuary at the Elephant Hill Camp, surrounded by the vivid tropical rainforest of Khao Sak National Park. 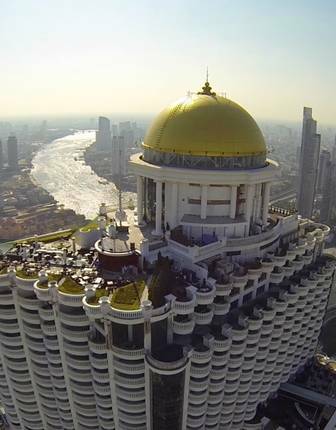 A contender for finest hotel in Bangkok, this luxury treat is surprisingly affordable considering its clutch of awards - including 'top hotel in Thailand' from readers of Condé Nast Traveller. 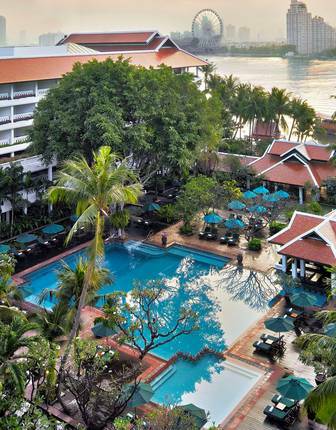 Bangkok’s feel-good bustle and buzz factor is within easy reach of the Anantara Riverside. 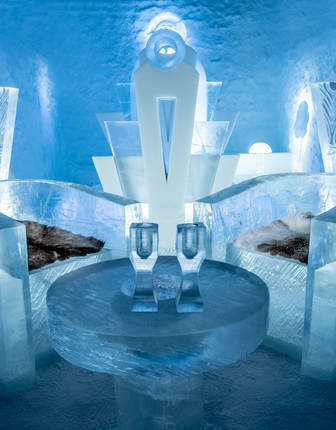 Within this luxurious resort however, a sense of serenity prevails and city streets seem far away. The slow and sinuous river runs right alongside, scenic and mesmerising. This gorgeous beachside resort brings more than a touch of sophistication to the Thai island that's been a classic among spiritual travellers and full-moon ravers for decades. 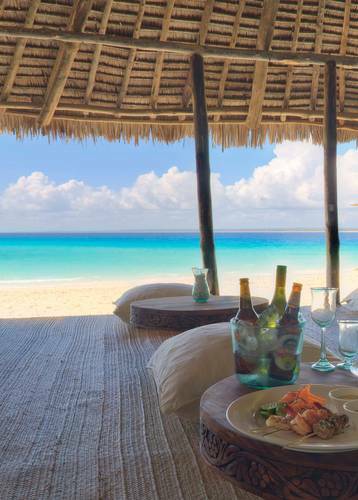 At Santhiya, its white sands and turquoise waters are taken in by everything from private-pool villas and gourmet restaurants to beach massages and complimentary kayaking. 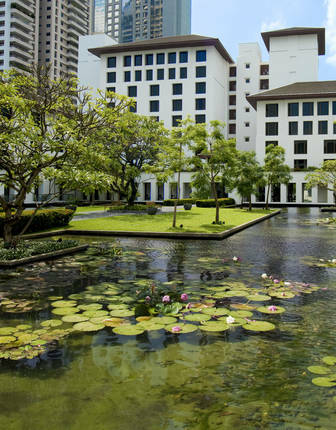 A designer jewel amid the Thai capital's bustle, the Sukhothai offers quiet respite in the form of spa treatments, ultra-stylish rooms and gourmet dining. You can travel to Thailand during any month although conditions vary from region to region and, indeed from coast to coast. The west coast beaches – Krabi, Phuket et al – are at their best during winter when the water is at its clearest for diving and snorkelling. Conversely, the east coast sees the heaviest rains in November and the driest months are between January and February. That said, even during the rainy season the downpours are short, allowing for plenty of beach time. Also, there are fewer crowds and prices are at their lowest.